Sleeping arrangement: Bedroom #1: 12′x14′ with a Queen sized bed. This bedroom also has a separate, private entrance to the soaking tub alcove (a large jetted tub) and porch. Bedroom #2: 9′x11′ with a full sized bed. Bedroom #3 (Master Bedroom): 12′x14′ with a Queen sized bed and expansive closet. The Childs room is directly accessed from this room. It sports a full-sized crib and a Jr. bed and Lots of toys!! Unlike many other Lodges, your reservation secures the entire Lodge all to yourself and your guests. We don’t rent out each room individually - Priced for 2 people, up to 8 adults and kids. Adults will love the spacious family and dining area on the first floor, and the kids will love crossing the walkway above in the Loft. The loft area is perfect for sleeping or playing too. We even have a Children’s Room with ample natural light for reading, a full-sized non-operating side crib, and a Jr. bed. Your group will love the farm-life and fresh chicken eggs! The lodge kitchen is 12′x12′ with extended counter space. The lodge is easy to get to thanks to Glacier International Airport. 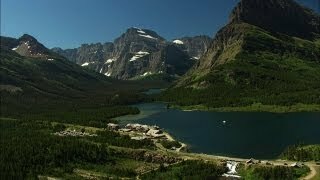 Of course, vacation time around here includes visiting “The Crown Jewel of the Continent,” Glacier National Park. Hikers, mountaineers, animal lovers and sight seers, you won’t believe Earth created such a masterpiece filled with awe-inspiring mountain peaks, waterfalls, and rushing streams. Here are some seasonal things to do: Winter: Skiing, hiking, dog sledding, and other outdoor activities. Spring: Mild days and crisp nights - golfing, white water rafting, hiking, boating and birding. Summer: Long days with no humidity - Glacier National Park, mountain biking, spending time at the Whitefish City Beach (only five minutes away). Ask us about the Festival Amadeus. Fall: Brilliant colors of yellow and red echo through the peaks and valleys - horseback riding, hunting, fishing or birding. When it comes to world class dining on a Montana budget - Whitefish serves up both and is the heart of the spectacular northern Rocky Mountains. * We require a RESERVATION/SECURITY Deposit to hold reservations. Our rates do not include State and Local Taxes and Fees. Pets are an additional charge. No land-line telephones. Check with your provider about service in NW Montana.